No new '77 series review this week, on account of being generally busy and sick, but I did write a piece for Pop Optiq about the first year of Marvel's new Star Wars comics. January 2016 marked the one year anniversary of Marvel’s new Star Wars line, launched in the wake of Disney’s acquisition of LucasFilm and the transfer of the comic book license to Disney’s in-house comic book company. In that year, Marvel has churned out comics on a level that is somehow both restrained and filled with gusto, in that, they released a ton of Star Wars comics in that first year, but at the same time, it would have surprised nobody if they’d released a whole lot more. The quality level of those comics, in three ongoing series (Star Wars, Darth Vader and Kanan: The Last Padawan) and five limited series (Princess Leia, Lando, Shattered Empire, Chewbacca, and one issue of Obi-Wan & Anakin) has remained remarkably consistent, maintaining a level of above average quality alongside some top notch issues and a (surprisingly) few out-and-out stinkers. Looking back over that first year, here are the ten best moments from across the line, the moments that made reading Star Wars comics this last year worthwhile. Not surprisingly, the very first story of Marvel’s new, canonical Star Wars comics featured Darth Vader as the central villain, bringing him face-to-face with Luke in a rare (for licensed Star Wars fiction) pre-Empire Strikes Back encounter. 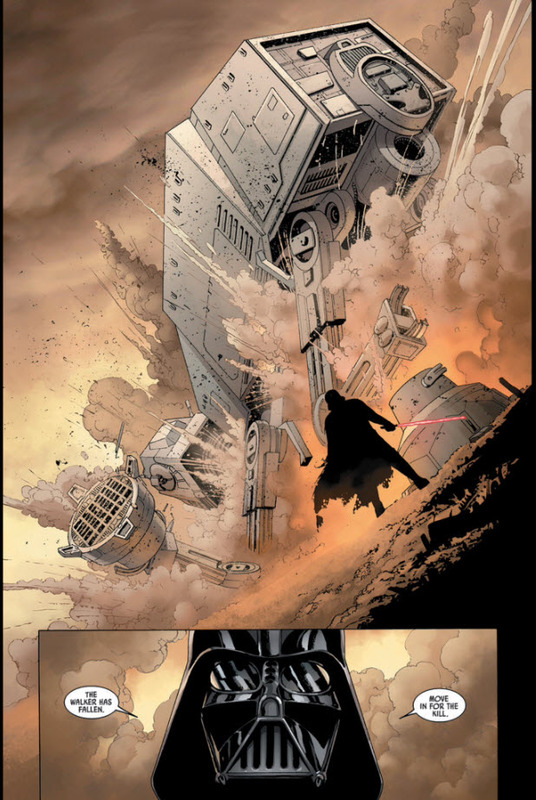 But the first real jaw-dropping, fist-pumping moment of the series comes in issue #3, as Darth Vader single-handedly brings down an Imperial AT-AT walker commandeered by Han Solo and Princess Leia. It’s a great bit of spectacle beautifully rendered by John Cassaday, and it not only establishes Darth Vader as a force to be reckoned with, but shows that the Star Wars comics are as capable of delivering high octane action as the movies.